Preserve Services has proven expertise in siding repair and replacement. The condition of your siding affects the quality and longevity of your paint job. 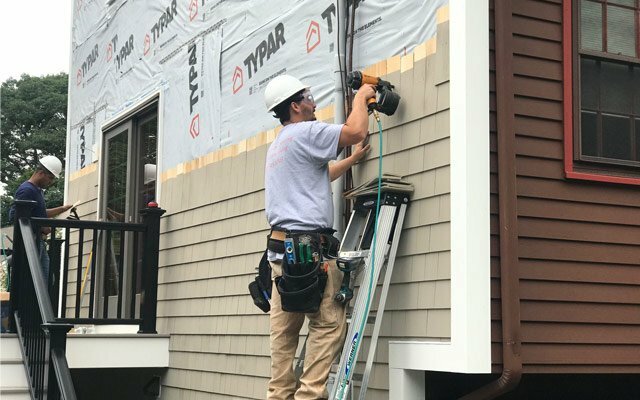 We work on small to large repairs as well as replacing the siding on your entire home. Preserve Services has a General Contractor’s license, registered as Home Improvement Contractor by the state of Massachusetts (license number 123553). We carry General Liability Insurance and Workers Compensation Insurance. Preserve Services will obtain permits in accordance with the law and requirements of your town. We will place a dumpster in the area you designate. Preserve Services will remove all the existing siding. We will inspect the sheathing. Preserve Services will install flashing above all windows, doors, and horizontal boards as necessary. Preserve Services will install an engineered underlayment appropriate for the structure. We will then install the siding as specified by the manufacturer. Exterior fasteners will be stainless steel or other exterior grade fasteners specified by the manufacturer. Preserve Services will inspect the work. We will walk with you around the structure to address any punch list items you may have. If required by your town’s building department we will have the siding inspected by the building inspector. Preserve Services replaced the siding on our home and did a wonderful professional job. The project was completed quickly, on schedule and with a high degree of quality workmanship. I was impressed by their great attention to detail and willingness to make sure we were happy with the results. Our house looks great and I would highly recommend their services to anyone. We are experts in installing both wood and cement siding. Cement siding is available from the manufacturer painted with a 15 Year Factory Warranty, saving you thousands in painting costs! Also, many of our customers also choose to upgrade their trim to a PVC trim, eliminating the need to paint your trim every five to seven years.